As a new year arrives and we start planning travel adventures for 2019, it’s a good time to look back over the past year at the places and activities we experienced. There was a good mixture of domestic and international travel and even a little time off between trips. This is what 2018 looked like for Larry and me. January: We arrived in Nepal after spending two weeks, including Christmas and New Year’s Eve in India. As many of you know Larry became ill and spent eight days in a hospital in Kathmandu, but before that happened, we traveled to the beautiful resort town of Pokhara. February: This was a month for recovery, but later we took a few days to visit San Antonio, a favorite city of ours that (fortunately) is just a little more than an hour away. Early spring blooms added color to the Chinese Garden near the San Antonio Zoo. March: During Spring Break we took a grandson to several notable sights in Central Texas including Enchanted Rock near Fredericksburg and scenic Pedernales State Park where rocks and water combine for a perfectly scenic romp. May: We finished that driving trip in San Francisco with adventures including a round of golf, wine tasting at a vineyard, climbing the tiled steps on 16th Avenue, and wandering around Golden Gate Park. Night time in Epcot just prior to the fireworks show. 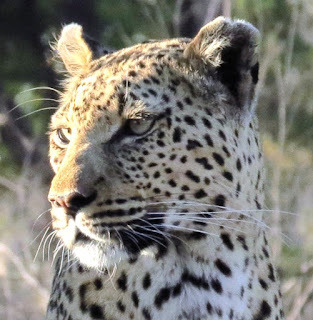 August: Our African journey continued into Botswana, a growing destination for incredible wildlife safaris. We stayed in multiple remote camps and were able to observe activities aimed to conserve Africa’s resources and preserve wildlife species like lions, elephants, and leopards. We watched this leopard stalking prey in Botswana. September: Although we had been to Ireland and London, England several times, we wanted to see more of the United Kingdom, so we booked a cruise that sailed around the UK and Ireland. Despite the hurricane that interrupted our trip in Scotland, it was a pleasant journey that ended with a day in Bath and the Cotswolds. October: We had booked a cruise on the magnificent Rhine River that started in Basel, Switzerland. Since we had five days between cruises, we spent that interlude in Geneva and went paragliding off a mountain in the Alps of France. Then we enjoyed the towns, castles, and vineyards as the ship sailed to Amsterdam. November: Most of the month was spent visiting children and grandchildren in various stateside locations, but one excellent Texas day trip we recommend is to Lost Maples State Natural Area. Fall colors made hiking on trails in the park an event to remember. Autumn leaves are especially beautiful in this rare Texas stand of maples. December: Back in Central Texas, we celebrated the holiday season with an evening drive to Johnson City for its Festival of Lights. We also walked down Austin’s iconic 37th Street and reminisced about visiting to the famous Trail of Lights at Zilker Park. This annual event never ceases to amaze as it grows better every year. Beaches along Big Sur are very different from the sandy, surfer-enticing waves found on southern California’s coast. For starters, some can be hard to find or access, but when you get there, you’ll realize—as we did during our April visit-- they are worth the effort. Rather than a vision of fun in the sun and splashing among curling waves, early morning may see fog hugging the coastline. Big Sur beaches can be cool even in summer, so don’t forget a jacket. And bring sturdy shoes since reaching the beach might require a hike from the parking area. Garrapata Beach: Located in Garrapata State Park—the only free park along Highway 1—the beach in the southern part of this 3,000-acre park is reached from trails leading down to the coast. With no headquarters or parking lot, we parked our car beside the highway and walked along a path to the ocean. It was lined with compact white flowers and other colorful blossoms in April, and it’s not uncommon to see artists with their easels capturing this gorgeous sight on canvas. This beautiful combination of water, rocks, surf, and blue skies attracts people for beach activities, even though the water is not really swimming temperature. SandDollar Beach: The largest unbroken stretch of sand in Big Sur, this crescent-shaped beach is protected from wind by large bluffs, so the weather is milder. 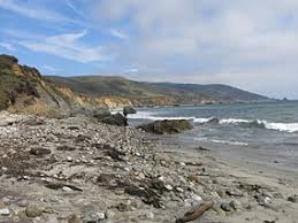 One of the few accessible beaches in southern Big Sur, it is located 14 miles north of the San Luis Obispo County line. That means it was a fairly long drive from our hotel in Carmel. An inclined path and 99 steps on a well-built stairway lead to down to the beach. A plethora of rocks at the southern end of the beach entice gem-hunters looking for jade and serpentine. Beachcombers scan the sand for washed-up sand dollars when the tide is out (we didn’t find any), and surfers often find this a good place to hang ten. PfeifferBeach: Hard to find on first try, stunning scenery makes this Big Sur’s most popular coastal access point. To find this beach, managed by the U.S. Forest Service, we had to locate the unmarked Sycamore Canyon Road. Hint: It’s the only paved, ungated road west of Highway 1 between Big Sur post office and Pfeiffer Big Sur State Park. After we found it, we turn sharply and followed the narrow, winding road for two miles. At the end was a large parking area and a short path to the beach. Cliffs tower above this breathtaking stretch of purple-tinted sand, and a large arch-shaped rock formation called Keyhole Rock just off shore makes for spectacular photo opportunities, especially at sunset. At low tide people can wade through the water to observe surrounding tide pools. Covered by towering, vegetation-heavy bluffs and striking rock formations, the beach’s expansive shoreline feels secluded from so many people streaming down Highway 1. Despite a cold, powerful wind blowing during our April visit, we spent an hour mesmerized by water crashing against the rocks. and rocky in others. At times the sand has a purple tint, too. Andrew Molera Beach: Although we stopped at Andrew MoleraState Park, 23 miles south of Carmel, we did not walk the scenic, mile-long path to the sheltered beach. The path meanders through a meadow filled with wildflowers and sycamore trees and provides fine views of the coastal mountain range to the east. The path parallels Big Sur River, which enters the sea adjacent to Molera’s beach. A bridge covers the river in summer, but otherwise you’ll have to wade across the cold water. Take a picnic and enjoy watching surfers or horse-back riders in the park. Ready for a new adventure? Think up—as in zip lining, sky diving, flying on a trapeze, or flyboarding. Get your thrills—with feet off the ground. Zip lining is fun for all ages. Each of these activities can take you out of your usual comfort zone--with minimum risk by people of average fitness. Just bring a sense of adventure and a willingness to try something new. The best part: You’ll gain self-confidence—and bragging rights--for your accomplishments. Zip lines: This popular activity can be found in almost any tourist location. Although every zip line offers a little different experience, all guarantee an exciting, rather than scary, ride along a metal cable through outstanding natural landscapes. Soar over canyons, streams, hills, or lakes or through a forest of old-growth cypress trees or over a national park. Take in scenic panoramas (be sure to look out instead of down) while whizzing along wire cables of various lengths—up to a half mile long. Some zip lines feature an automatic braking system while others require you to apply pressure to the cable for stopping as you approach the landing. Either way, this may be the perfect family adventure if children are at least eight years old (Some have weight restrictions, so check beforehand). Leaving the airplane to start descent. 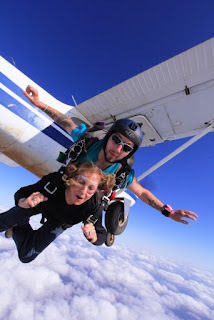 Sky diving: This is the ultimate exhilaration! Many people fear this activity, but it’s more a matter of anticipation and perception than actual danger. For your first time, you’ll go on a tandem skydive, so you can enjoy the flight while leaving technicalities (when to pull the parachute cord, for example) to the expert strapped on your back. As you flow through cool air above the clouds there’s really no sound; it’s eerily quiet and peaceful. Although sky divers free fall around 5,000 feet in 40 seconds, there’s little awareness of downward movement. If the outfitter you jump with provides a videographer, as many do, you’ll be distracted by waving at the camera. All too soon, you’ll feel a gentle tug as the jump master deploys the parachute—and you begin drifting slowly to the landing zone. Catch your breath during this relaxing time and survey the open landscape below. If you’re at least age 16, rev up your sense of adventure and go. Flyboarding: Strap a board on your feet, and rise on a stream of propelled water in a beautiful lake. Flyboards are platforms with boots, which you put on before being towed by a personal water craft (like a wave runner) from dock out into the lake. The PWC provides propulsion through a long flexible hose attached to the Flyboard jets. The instructor controls the amount of thrust while the rider controls direction that he goes. your body out of the water to ride the stream. Once you get the knack of lifting your body from a prone position out of the water, you can soar above the surface. Learning how to maneuver turns before plunging back into the water does take a bit of practice. When you’ve mastered that skill, you can start propelling yourself high enough to perform flips and other tricks. There’s no age limit for this brand of fun, but there’s a minimum weight requirement of 80 pounds. Getting last minute instruction before swinging out on the trapeze. Trapeze: If you’ve ever admired aerial circus performers flying through the air in their sparkling costumes, you might enjoy sampling the excitement in a trapeze class. There’s no age limit, but some flexibility is helpful. You can go all out and learn some tricks or limit your activity to swinging from the trapeze, if that’s enough excitement. This was the achievement of my dream! During a two-hour class you’ll practice first on a floor-anchored bar. Each participant wears a safety belt that is tethered to the apparatus, and there’s a large net into which you’ll drop after performing tricks on the trapeze. The class culminates with participants (some of them, anyway) actually flying from a trapeze and getting caught by a hunky acrobat on another trapeze at the opposite end of the apparatus. What a thrill! California's Big Sur coastline is one stunning picture after another. Indeed, it has beaches, mountains, forests, and valleys. All this scenic geography melds into natural grandeur along the coast. Outdoor enthusiasts often think this is as close to heaven as you can get. Winters are mild due to closeness of the Pacific Ocean, while coastal fog cools summer mornings. But the fog lifts by early afternoon, and there is plenty of sunshine year round. We like to hike as well as enjoy spectacular beauty of the landscape while driving, so this seemed an excellent choice for a week-long trip. With our home base at Hyatt Carmel Highlands, we found plenty to explore along this designated American National Scenic Byway. Pfeiffer Big Sur State Park: As we left our resort to drive to this park, fog on the ocean and mountains kept temperatures cool. Ocean swells splashed against rocks up to 20 feet in the air. Spring flowers like blue lupine, orange poppies (state flower), white calla lilies, and so many varieties of red, pink, yellow, and white flowers grew near the shore, on rocky slopes, and grassy meadows. In other words, springtime was blooming everywhere. Spring wildflowers are simply gorgeous. Lovely rolling hills dotted the landscape with bright green pastures while cedar trees clumped with wide, intertwining branches. Ancient redwoods thrive along a very narrow strip of Big Sur in this vicinity. We hiked uphill on Valley View Trail for views of the landscape below. The return was easier, of course, after which we enjoyed a picnic lunch in the park area before walking the Nature Trail and River Trail, both short and easy. Big Sur River runs through the park, which is further inland, so it doesn’t offer the same stunning ocean views as oceanside parks. GarrapataState Park: Highway One passes within the borders of this free park situated between the base of St. Lucia Mountains and the rugged Pacific coastline. This large park overflows with trails highlighting its diverse landscape. Five main marked trails, four of which are grouped together in a loop going into the mountain range, provide opportunities for hiking and backpacking. We walked to the beach on a path lined with tiny white flowers, crossed a scenic bridge, and thoroughly enjoyed wandering in this lovely park. BixbyBridge: Construction of this dramatic bridge allowed travel more easily along the coast, especially when Highway 1 was completed in 1937. Stunning views are worth stopping for as the bridge arches over the gorge where Bixby Creek flows and empties into the sea. From the north side of the bridge we could get photos of ocean and land—cliffs, bridge, and road heading up the mountain. Views from the south side after crossing the bridge were more expansive. JuliaPfeiffer Burns State Park: Named for one of Big Sur’s most beloved pioneers, this park features seven marked trails. One popular trail leads to McWay Falls. Driving to the park the highway climbed nearly 1,000 feet above sea level, and Overlook Trail to see the falls descends for a closer look at McWay Cove and the falls below (after traversing cliffs high above the ocean). At the overlook, we saw a creek that finishes its short journey in dramatic fashion forming 80-foot McWay Falls which plunges directly into the ocean. LimekilnState Park: One of the smallest state parks in Big Sur, it is often overlooked by visitors driving along Highway One. The park got its name from the limestone business that thrived there in the late 17th century. Limekiln was also the site of a thrilling waterfall hike for Larry and me. To reach the waterfall we had to cross Limekiln River three times each way—and not by bridge. Logs strewn across the river in a hodge-podge manner provided our only option for getting across—not so easy as the logs shifted with the moving water and our own ability to balance was sometimes questionable. But we managed to stay dry—unlike other hikers we witnessed who got wet and cold when a foot slipped. So we agreed the trek to the stunning 100-foot waterfall was worth the challenge. Vertical blue streaks interact with horizontal layers of ice at Portal Point. On our Antarctic excursion, the first sight of glaciers outside our cabin window was totally exhilarating. Later that morning, as we skimmed the ocean’s surface in a Zodiac from the expedition ship to our first continental landing at Portal Point, the peninsula’s glacial plateau came ever closer. Beautiful slopes of snow and ice and a spectacular rocky peak of a nunatak rising out of the glacial masses was simply breathtaking. Variations in color, shape, and texture make each iceberg unique. For me, seeing the indescribably beautiful ice of Antarctica was emotional. The enormous ice sheet stretches as far as the eye can see and is even visible from space. Viewing this distinctive sight seemed surreal, unlike anything else on Earth. Maneuvering around brash ice can be tricky. It’s this amazing visual that brings most visitors to Antarctica—the full kaleidoscope of colors, shapes, and sizes. Shades of green, blue, and white. Some icebergs smooth and glistening; others with a grainy or crunchy appearance. Pointy, triangular, chunky, or flat on top. Small bits of brash ice or giant islands moving slowly through the water. But if you listen closely, you realize that the ice has a voice. The most noticeable sound is the loud crack heard when a chunk separates from a larger mass and falls into the ocean, a process known as calving. If the chunk is very large itself, the noise can be almost deafening—and the situation dangerous. But there are more subtle sounds such as the whoosh of gases releasing from floating bits of ice or the gentle swishing of movement in the ocean. It's hard to imagine than 2/3 of the iceberg lies underwater! Touch a piece of glacial ice, and you’ll immediately feel a stinging cold. Glacial ice is denser and has larger crystals than ordinary ice, so it feels much colder and melts much more slowly. Put a piece in your drink, and it will last all day. from large icebergs such as this pure white beauty. Another sensation created by icebergs surprised me. At times, when we were floating in a Zodiac, it felt like the sea was shifting under the weight of these enormous ice sculptures. Since most of an iceberg is underwater, the whole structure could heave with the rolling waves. One day, as we approached Cierva Coves at the southern end of Trinity Island, our Zodiac dodged brash ice while we watched icebergs surf the swells, rising and falling with ominous force. Needless to say, we kept our distance. Wind and water can create peep holes like this in the ice. From our guides we learned that even though many glaciers are retreating and there is 40 percent less ice worldwide than 50 years ago, sea ice such as in Antarctica is advancing and as a whole is increasing in volume (surface area and thickness). Still warmer temperatures affect the food chain and wildlife in different ways, which is an ongoing cause for concern. The blue color of this smooth iceberg contrasts with clouds in the sky. The ice of Antarctica is a wonderland of incredible beauty. To me, the experience felt like skimming through a dream—like Alice in the rabbit hole viewing impossible sights that couldn’t be imagined unless you were there. I never tired of watching the infinite ice forms move through the ocean water. What a thrill it was to discover this magical land! The bumpy surface of this iceberg resembles a half-eaten snow cone. When it comes time to retire from the working world, do you know what you want to do next? For many boomers (and boomer pluses), having the time and ability to travel is a dream come true. But where do you start? And how do you plan travel? Taking short trips (a week or two) can ease retirees into a travel mindset and test their tolerance levels for lengthier sojourns away from home. 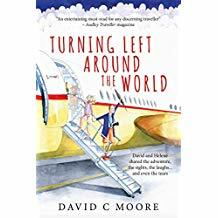 Brit who worked in advertising and marketing before retirement, wrote about their adventures in a book he called Turning Left around the World, a title that is appropriate since they decided to follow the sun and go west on their journey. This is a delightful book that recounts of their adventures; it is nostalgia but a whole lot more. Moore has shared good times and challenges of long-term travel in an entertaining account, starting with the intriguing method they used to decide where to go and the company that helped them plan their custom journey. In addition to describing the destinations and highlights along the way, he includes fascinating facts about the history and culture of places they visited. Using a chipper British conversational style, Moore describes the landscapes, food, and people they discovered while traveling on 53 flights, 30 trains, 8 boats, 3 cruise ships, a hot air balloon, and a multitude of other transportation means. A map included in the book follows the path they took—a path that led them to Chile, Ecuador, and Peru in South America. They continued on to New Zealand, Australia, Malaysia, Thailand, Cambodia, Vietnam, China, and Japan—all the while sharing personal stories and impressions of the exciting places visited and adventures experienced. If you have a sense of wanderlust and an empty or nearly-empty nest you’ll enjoy reading this memoir. Along with more than 100 colorful photos, Moore’s warm and witty writing style might just convince even reluctant travelers to set up a similar personalized journey. According to Moore using one-on-one guides in notable destinations can make all the difference in what you get out of traveling to far away and exotic places. The book is available in paperback and eBook at Amazon and other online retailers.